26-09-04, Parentage: 'Hansa' X "Magseed". Appearance-wise this is a completely unremarkable hybrid, but I value what it represents genetically. The pollen parent was given to me by it's creator Ralph Moore years ago; a cross of 'Anytime' and 'Rugosa Magnifica'. 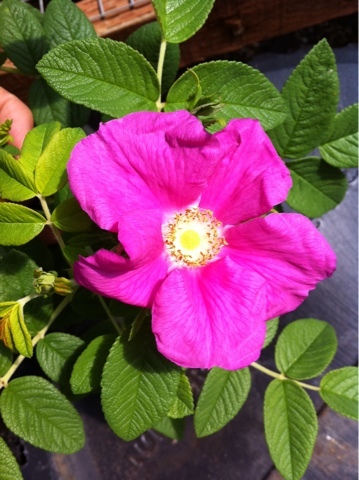 By crossing it back to an older "purebred" Rugosa I hoped to regain some of the Rugosa strength, character and, hopefully, health while infusing some of the modern miniature traits like generosity of bloom. Clearly this seedling is not just a selfing of 'Hansa' since it has that odd "antler" pubescence often seen in Rugosa/modern hybrids. It has yet to be seen if this cultivar has merit as a garden shrub, but I plan on working it forward with other diploid breeding lines. I see a marriage with 'Therese Bugnet' in it's future.